Justice O’Connor is a trailblazer. She grew up on a ranch in Arizona. After she graduated from Stanford Law School, she worked as a deputy county attorney in San Mateo, California and as an assistant attorney general in Arizona before she was appointed to fill a vacancy in the Arizona Senate. 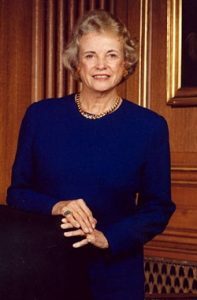 She is the first woman to have served on the United States Supreme Court, and she served with distinction from September 1981 to January 2006. In addition to her legal accomplishments, Justice O’Connor is practical, empathetic, and considerate. She has championed civics education for decades. She is a woman for all seasons. For more information about her groundbreaking iCivics program, visit their website. See the full text of her public letter.